The Bermuda Tourism Authority [BTA] will launch a competition next month to determine the island’s best fish sandwich and is asking residents to help with the search. “Visitors to any destination want to eat where locals eat,” said BTA Chief Product & Experiences Development Officer Pat Phillip-Fairn. “With this competition we will challenge our restaurateurs to win the endorsement of locals on the often debated topic of great Bermuda fish sandwiches. The Chamber of Commerce Restaurant Division has been notified of the upcoming competition and the BTA is inviting all other restaurants to also participate. Restaurateurs are being given notice of BTA’s Best Fish Sandwich Competition so they can prepare for its start on August 4, 2015. The competition will last for two weeks. 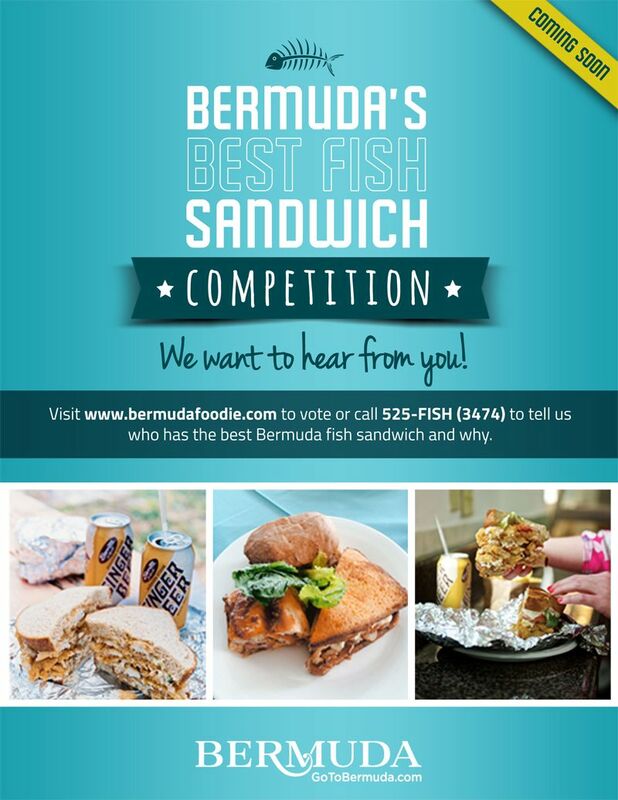 During that time the BTA will ask residents to scour the island in search of the best Bermuda-made fish sandwich and then vote for their favourite online or by telephone. The restaurants with the highest volume of endorsements from locals will advance to a second round where a panel of judges will crown Bermuda’s Best Fish Sandwich. Any restaurant taking part in the competition is asked to let the Tourism Authority know between now and July 29, 2015, by calling 525-FISH  or sending notification via email at experiences@bermudatourism.com. Mrs Phillip-Fairn said: “Restaurant Weeks this year showed us that a well-run culinary promotion can noticeably improve the bottom lines of our stakeholders. “We hope the Best Fish Sandwich Competition will also grow sales for local restaurateurs, particularly takeout counters who don’t take part in Restaurant Weeks because it’s a dine-in promotion. Will this mean the FISH should be local fish? I agree, very seldom do you find local fish sandwiches on the menu, most times the restaurant that do serve it run out early. Seaside Grill has the best fish sandwich hands down.. I guess the next step would be trying to get tourist here, what a brainstorm for $100,000 bonus. As nice as that would be…at $30 per pound for local filet (although I am sure they could get a slightly better rate than that)it wouldn’t be financially feasible. With the amount of fish these places put in a sandwich the cost of the sandwich would skyrocket if it were local fish. All I’m saying is, Art Mel’s better NOT win. Buzz has a better fish sandwich than them ffs! Woody’s by far, but I agree with the other statements, Fresh Local Fish is hardly sold that’s why I buy my own fish and make my own sandwiches. Err… that prize has already been won by Aunt Mels. Should come up with something else where restaurants at least have a chance to be competitive. Art Mels is grosss the only thing good about the sandwhich is the seasoning not the fish !!!! I agree with both R & Jr Smith. If tourist want a local experience, they should be treated to local fish. That’s what makes it unique! My 1st vote goes to WOODY’S! This is a great way to get travelers to visit local restaurants and ‘dine like locals’. I can’t wait to cast my vote. If locals really want to send tourists to where you can get the best ‘local’ fish then they should be sure to cast their votes. How can that be when this when this Government acts like they don’t want locals to interact with tourist. I would try Woody’s but I don’t want to be shot or cut! Should we really steer our innocent tourists there? What you mean ? Sea side grill has thes best fish sandwhich’s handsdown ! Lmfao….. Same thing Art Mel’s uses! Foreign fish and all batter. One must take into consideration the availability of local fish… If my most popular menu item runs out due to lack of supply am I as a business owner meant to take the hit and choose not to feed my family this week? I think not.. I don’t hate on any business for choosing to make a profit. However, I WOULD take issue if the business owner asserts that they only use local fish and you find out otherwise. Just some food for thought…. That’s where truth in advertising comes in play, hopefully. People would appreciate the honesty if the server or chef indicates if they’re out of local fish for a product that ordinarily is advertised as local. Fish sandwich or mush sandwich? Art mels food has gone back, sorry but don’t even include them in the competition. Whether local fish or not Art Mel’s is número uno……perfectly fried never greasy and great fries……Lobster Pot’s cup match fish sandwich is great too….. Fish must be fresh and local. Full stop. Am happy to volunteer to taste test. Hope there’s a People’s Award to vote for. Tribe Road Kitchen. My Friday treat. Their’s is too salty and got sick from it there once, will never try it again . Great idea! But it has to be local fish. These restaurants/cafés have enough time to get themselves some local fish. Mr. Chicken has a really good fish sandwich! Just as good as Art Mel’s too! Every restaurant in Bermuda uses Swai fish for there sandwiches, there isnt any local fish…period. For restaurants to serve local fish we would need 50 more full time fishermen and some fish in the ocean to catch. Word has it that a guy is starting a fish farm in dockyard but fisheries will only let them use tilapia, would that then be local tilapia. I guess that will be fitting being that everything else is anti-local. Cafe Ole @ Crystal Caves sells wahoo. They recently changed management and one of the first things they did was take tilapia and swai fish off the menu!
. BTA will be marketing best fish sandwiches in Bermuda to the tourists? Or just another local BTA project ? What happens to tourism business at all the other restaurants that sell fish sandwiches but were not #1? As a judge of fish sandwiches, I get all my sandwiches free from participating restaurants, correct? Shouldn’t BTA being trying to first get tourists to come to Bermuda and the Chamber handle all such contests? Can we please have a moment of silence for the sad demise of Black Horse. Theirs was the best fish sandwich EVER. I used to go there every Friday for a fish sandwich. I miss that place so much. 3) and probably my house (cause at least I fry up local fish) lol! Are any fish sandwiches made with Bermuda fish anymore? I will tell you. It is too expensive for a restaurant paying all the small biz taxes the govt heaps on them plus the exhorbitant Bermuda wages and utilities to make a buck selling a darn fish sandwich for less than $12 … and if it was Bermy fish it’d be like $20. Would you pay that, yet that is what the market says it should be in Bermuda for a restaurant to make enough to survive. yes do the math. Famous Art Mel’s is not Bda fish-according to TripAdvisor all the tourists say it is foreign … yet BTA keeps supporting it. It’s a crying shame that we are surrounded by beautiful waters but yet we cannot supply ourselves with bermuda fish on a regular basis…yup!let’s go independent!! I agree, that’s like Texas or Argentina importing beef. Sea Side Grill does a great fish sandwich. But the Dockisder “Back-o-town” fish sandwich is the bomb!! Best fish sandwich on the island is from Black Horse, hands down. They only use local wahoo! Only problem is figuring out when they are open! Black Horse chef and hostess are now running the restaurant above what used to be Pub On the Square in St. G. We had wonderful fish sandwiches on Mother’s Day. A hidden gem. Woody’s by far should win this. Wahoo sandwich topped with coleslaw and tartar sauce?? Oooo my dear!! Real local fish. Not that imported art mels fish that everyone is brainwashed to like. Better be somewhere that sells wahoo and not some damn foreign fish. KEEP IT LOCAL. Lionfish Sandwich competition would be a great idea. It’s so plentiful in our waters! If you the best fish sandwich was got to go WOODY’S!! My vote for best fish sandwich would go to Harry’s. I make a point of stopping there for lunch just about every day after I spend the morning at Miles enjoying the sights. Newport Room used to have a decent fish sarnie as well – it always tasted better after a few glasses of Dom Perignon ’73. I haven’t tried Art Mells yet…is it served with a frois grois and truffle infused Peruvian slaw? why not make it the best fish sandwich made by Bermudians and if you make if local fish made by locals that would narrow the field down even further…. Only ‘real’ Bermudian fish for you, right? The ig-grunts are the best. When did black horse close? No one has mentioned Freeport Gardens in dockyard…my favorite boat stop/destination and get a takeout. Black Horse always had the best in my opinion, fresh local fish, and could get grilled or pan fried, as well as deep fried. I heard they are back open too! After reading this article yesterday, I was in the Northshore area today and decided to stop and try Seaside Grill. I purchased a Wahoo fish sandwich on raisin bread. Boy was it good. I will recommend Seaside Grill to anyone. The girl in the front also said Seaside will have a Cupmatch stall in St Georges this year. I will def support them when i go to the Cupmatch game. I’ve had lots of great tasting fish sandwiches in Bermuda I wish all the restaurants good luck in this competition. Yes seaside grill has OK fish sandwiches but whats making me mad is the fact that people really think they use LOCAL wahoo. Seaside grill buys their wahoo frozen and imported from Amber Fisheries in st davids. Yes its good tasting fish but its NOT local and they will tell you this. Blackhorse had the BEST fish sandwiches and art mels needs more credit, as for TASTE their fish sandwich is really good. And he uses imported frozen snapper NOT swai! seaside grill uses frozen imported wahoo. not fresh bermuda wahoo. and the managers wud tell you theirselves. Blackhorse had the best fish sandwich but they’ve closed down. eager to try Woodys but until then ARt Mels wins in my books!